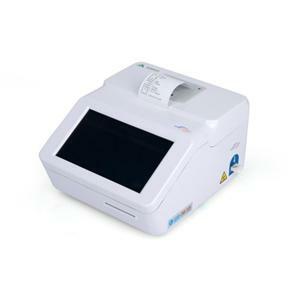 NRM-FI-1000 Fluorescence Immunoassay Analyzer is a quantitative system which can accurately read and analyze the test results of the Fast Test Kits. 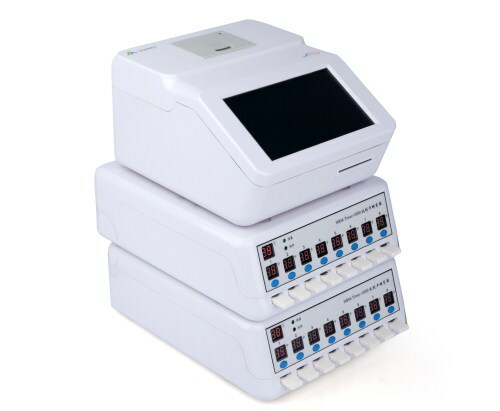 It is a portable system for diagnosis and risk stratification of cardiovascular diseases, kidney disease, diabetes, bacteria or virus infection, etc and prognosis. 1. 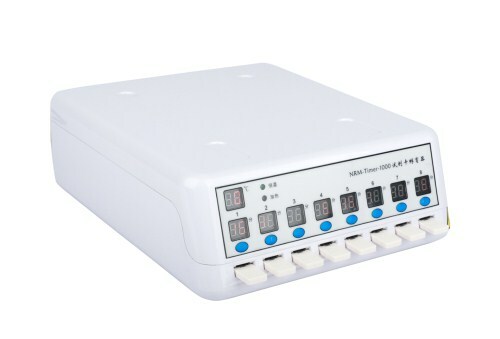 One incubator can incubate 8 samples simultaneous. 3. Automatically prompt after incubation , set up time from 5 to30 mins according to different assays. 7. Portable and practical: small, easy to carry and place. 8. Intelligent management: touch-screen control, can be connected to LIS and HIS system. 9. Application: outpatient, emergency, Medical Center, cardiology department, etc. Certifications： CE /ISO13485/SGS/Free Sales Certification. The principle of chromatography is a kind of separation technologies based on using physical property differences from components in mixture. 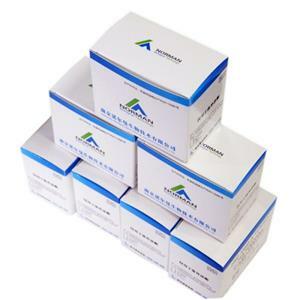 (Such as adsorption force, molecular size and shape, molecular polarity and molecular affinity, partition coefficient, etc.) 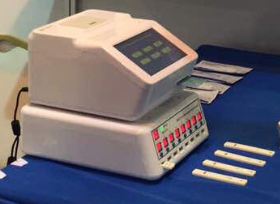 Chromatography system consists of stationary phase and mobile phase. The stationary phase is solid substance or components fixed on solid substance while the mobile phase refers to the flowing materials, such as water or various solvents. Chromatography process: when to-be-separated mixture goes through the stationary phase with the mobile phase, due to the differences between the physical properties of various components in the mixture. Components that have weaker interaction with the stationary phase have the faster velocity because of the smaller blocking effect while components that have stronger interaction with the stationary phase have the slower velocity because of the larger blocking effect. In that case, components in mixture are separated. 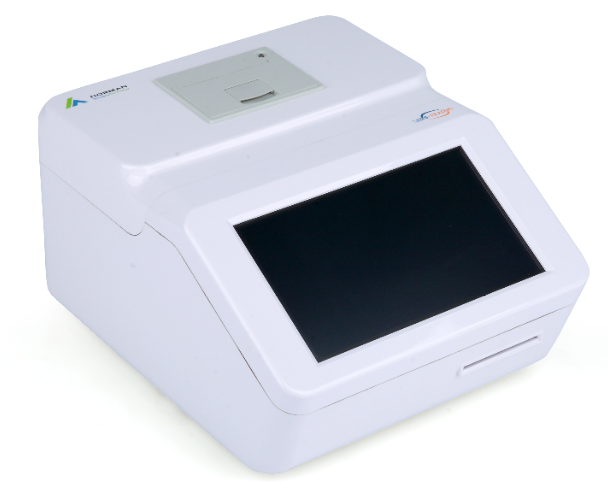 Immune chromatography technology is a new immune test technology based on the chromatography and the specificity immune response of antigen and antibody. 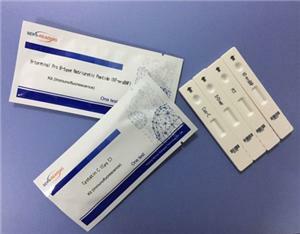 Immune chromatography technology uses strip-shaped fibrous chromatography material fixed with test lines and control lines as the stationary phase and test liquid as the mobile phase, and the movement of determinands on the chromatography strips is realized by the capillary effect. 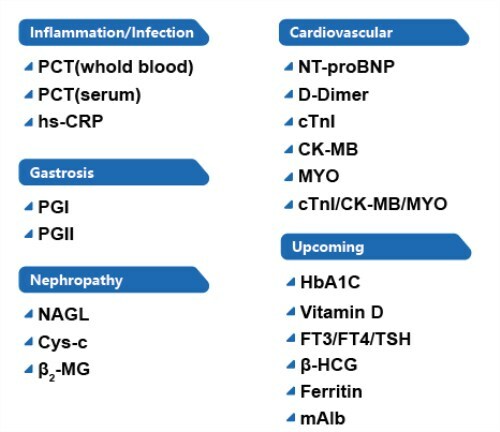 Determinands’ specific immunoreactions occur at line T while the free substances occur at line C.
Commonly-used immunofluorescence chromatography can be divided into competition approach and sandwich assay. 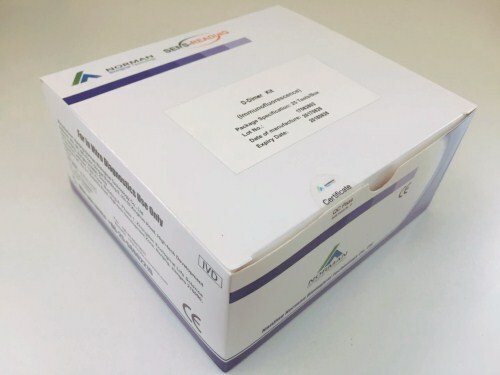 Competition approach refers to the process that some kind of antigen in determinands as well as in line T competitively combines with fluorescently labeled antibodies. Sandwich assay is the process of the specifical combination of some kind of antibody (antigen) in determinands and antigen A (antibody A) with fluorescently labeled antigen B (antibody B). 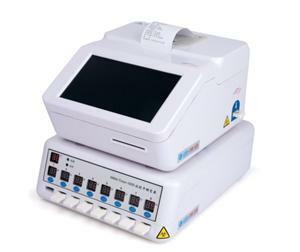 Fluorescence quantitative system mainly does analysis and processing on the testing card. 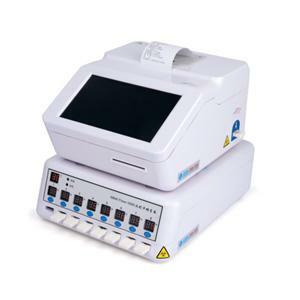 Its principle is：Insert the testing card into the immunofluorescence quantitative analyzer after reaction, and then the test system of the instrument automatically scans line T and line C to obtain the optical signals. After that, material concentration could be quantitatively calculated by measuring and analyzing the optical signals. This instrument is based on modern optoelectronic technology and applied in the quantitative analysis of immune fluorescent reagent strips and, more importantly, could detect the related parameters of the human body samples for clinical auxiliary diagnosis. 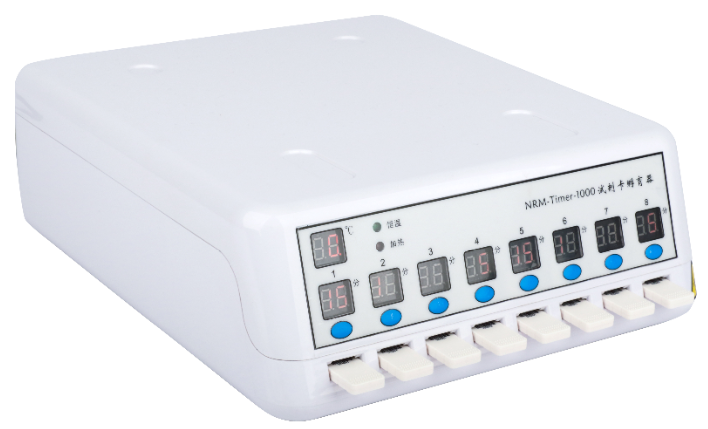 Nanjing Norman Biological Technology Co., Ltd is dedicated to R&D and manufacturing of automated chemiluminescence system. 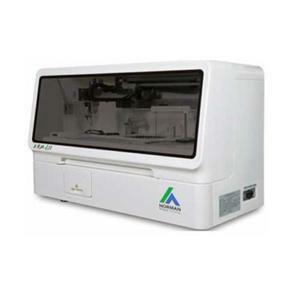 Founded in 2008, Norman biological has been upholding the idea that R&D shapes future,and concentration determines success.Ever since the beginning,Norman has been focusing on developing and manufacturing chemiluminescence and immunofluorescence instruments and reagents. Powered by advanced technology and excellent talents in the IVD field, Norman has been consistently improving its innovation platform , and increasing R&D investment.Self-innovation,combined with long-term strategic cooperation with universities and research institutes and with outsourced technologies, ensures consistent improvement on product quality. 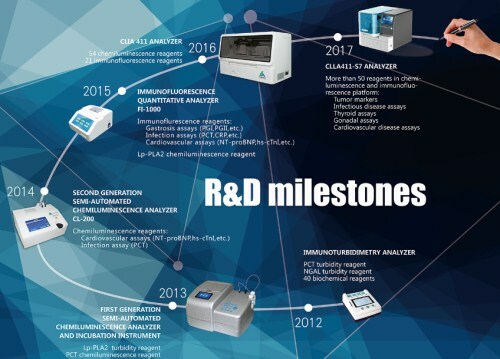 Norman's R&D field has covered instruments, reagents, and raw materials,and has been entrusted by the Nanjing government to build a R&D center specialized in biological chemistry and immunity diagnosis. Up to now, Norman has acquired over 20 patents. 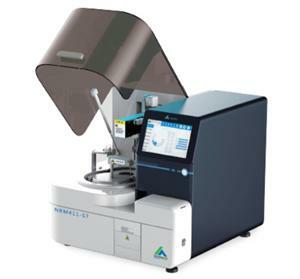 Being an expert in automated chemiluminescence analysis ,Norman owns independent and completed intellectual property rights, and its products provide top-notch sensitivity,precision and accuracy.Thanks to the self-developed antigens and self-manufactured antibodies,Norman's products features minimized intra-and inter- batch difference. After 8 years development, Norman is now on the fast track. An over 30,000m2 global R&D center is in construction,will hold more than1,000 R&D engineers in the future.R&D shapes future,and concentration determines success. Driven by the commitment to "provide complete solution to improve human health", Norman will consistently do its utmost to drive the IVD industry forward and contribute more to human health. 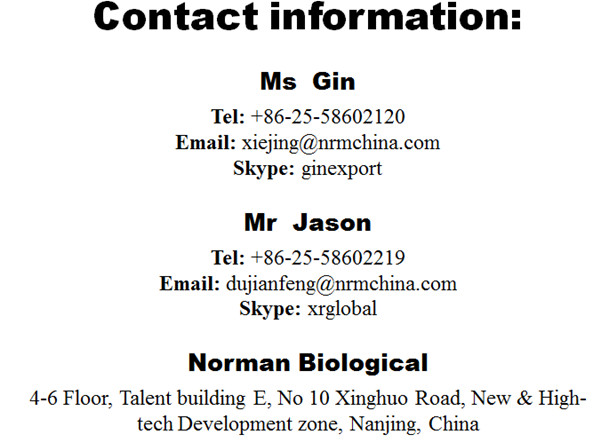 Agent Wanted: If you are interested in working with us, please feel free to contact. OEM and ODM are available !